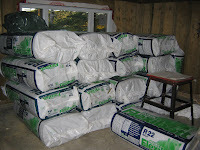 I received a shipment of insulation last Friday. It is a bit early than I really need most of it but I am at the stage where I need to start insulating a few areas. While I don't need it all now I decided to accept all the order in one lump. I am using four sizes and two types of insulation . Each is targeted for a specific use or location in the Cottage. R22 - 2"x6" insulation for 16" centers. This insulation will be used everywhere we have framed 2"x6" exterior walls. This will be in all walls on the main floor and in the lakeside wall in the Basement - you will remembers from a past post that the basement is a walk-out, hence the lakeside was not concrete but framed using 2"x6" pressure-treated lumber. R14 - 2"x4" insulation for 16" centers. This insulation will be used everywhere we have framed 2"x4" exterior walls. Specifically this will be the walls we framed on the inside of the concrete walls of the basement in order to house the electrical and insulation. R14 - 2"x4" insulation for 24" centers. R22 - 2"x6" insulation for 24" centers. This insulation will be used in the ceiling as the roof trusses as framed at 24" centers. This layer of insulation is placed perpendicular across the previous R14 insulation to bring the total R-value in the ceiling to R36. NEXT: In the next post I will discuss my choice of brand of insulation.